Pick your Poison: Gin & Dubonnet – Happy 90th Birthday, and World Gin Day, your Majesty! Happy 90th Birthday, and World Gin Day, your Majesty! “Let us not take ourselves too seriously. None of us has a monopoly on wisdom”. Her Majesty the Queen is 90 years old today and, to top off an already EPIC day, it is also World Gin Day!!! For me, this is even more exciting than Christmas and my birthday! In celebration of this momentous day, I have made our Liz’s tipple of choice and, funnily enough, it contains Gin! How good is that?! Lizzie is such a trendsetter, she was in on this Gin revolution long before any of us mere mortals were. So, without further ado, here is the recipe for Gin & Dubonnet. Place the Gin and Dubonnet in a Cocktail shaker. Shake until the Cocktail shaker is cold on the outside, about 20 seconds. Pour into a glass of choice and add a slice of fresh lemon and a few ice cubes. Bottoms up everyone! Here’s to you Queen Elizabeth II, you complete and utter legend. I love the Queen, and Gin, in equal measure (make mine a double). Queen Elizabeth, in my eyes, is a completely awe inspiring and wonderful woman. Born in a turbulent era for the world, knowing and seeing the horrors of war first hand, devoting her life to selflessly serve her Country, being a Mother, a Grandmother and now a Great Grandmother. She has experienced love and loss and, through it all, has maintained her composure, dignity and morals. In my opinion, she is one of a kind, and I feel so lucky to have been born in a time where I have been able to grow up ‘knowing her’. She has done wonders for the Royal Family and their perception by the public. She has reached out, made them more personable and ensured the next generation of Royals continue in this way. 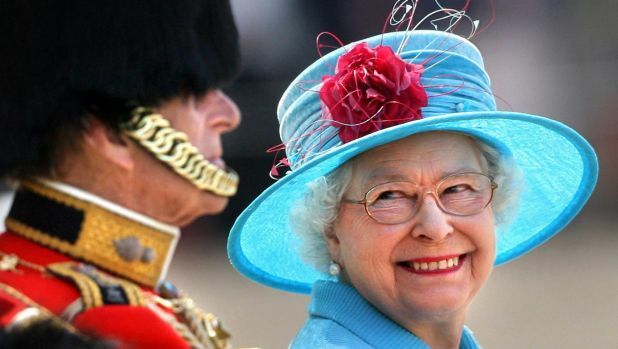 The Queen, smiling and laughing when she realised Prince Philip was one of the Soldiers on parade. He hadn’t told her he was going to don a Bearskin hat and stand on parade, I think the look on her face is utterly wonderful. True love. I understand some people think the Royal Family has ‘had it’s day’, that they aren’t required in this day and age and they’re ‘out of touch’ with the people. However, for me personally, I couldn’t disagree more. I am proud, most of the time if you exclude the recent behaviour of a few ‘England Fans’ in France for the Euro 2016 Football, of our country. I am proud to be able to say I am British and I love our history and heritage. That’s what helps makes Britain Great. My most favourite ‘Queen moments’ are these two. For me, they sum up all that I love about her. So, on your 90th Birthday (and World Gin Day) your Majesty, happiest of happy birthdays. The Queen is also said to love this song by Fred Astaire, Cheek to Cheek. I think it’s a wonderful song too, and I can just imagine her popping this on of an evening and tapping her foot to it whilst sipping on a G&T in her favourite chair. So go on, put this song on, make yourself a Gin & Dubonnet and raise a Gin filled glass to The Queen on her 90th Birthday! I know I will be. I love the royal family! Yes, they do sometimes seem a little stuck in their ways, but they are royalty and a national institution! She is amazing, especially for her age and I really love that photo of her smiling at Prince Phillip!